The number of book readers has dipped a bit from the previous year and the number of e-book readers has remained flat, according to new survey findings from Pew Research Center. Seven-in-ten American adults (72%) have read a book within the past year, whether in whole or in part and in any format, according to a survey conducted in March and April. That figure has fallen from 79% who said in 2011 they had read a book in the previous year, but is statistically in line with survey findings starting in 2012. Many book publishers, researchers and retailers have wondered whether the introduction of e-books would impact book reading overall or lead to a decline in the number of books read in print. This year’s data show a slight decline in the number of American adults who read print books: 63% of American adults say they read at least one book in print in the past year, compared with 69% who said the same the year before and 71% in 2011. The survey data – which measure who has read at least one book in whole or in part in the previous year, how many they read and what formats they use – come as industry data out last month indicate that Americans remain hybrid consumers. Digital sales, which comprise about 20% of the market, have slowed sharply, while print sales have stayed relatively strong, according to the Association of American Publishers. Several years of Pew Research Center survey data indicate there has been little change in the share of adults consuming e-books or audio books. 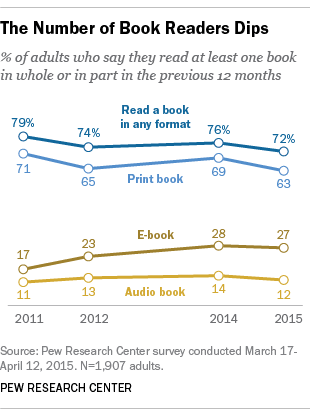 The new survey shows that 27% of Americans read an e-book in the past 12 months – up from 17% in 2011. But that figure is statistically similar to the size of the e-book reader population captured in a Pew Research survey in 2014. Audio book consumption has remained stable, with 12% of Americans saying they listened to a book that way. The data reveal a somewhat surprising generational pattern in book reading. Young adults – those ages 18 to 29 – are more likely than their elders to have read a book in the past 12 months. Fully 80% of young adults read a book, compared with 71% of those ages 30 to 49, 68% of those 50 to 64 and 69% of those 65 and older. Among all Americans, the average (mean) number of books read in the previous year was 12 and the median (midpoint) number of books read was four. Some 27% of adults said they hadn’t read any books over the past year, while 1% said they did not know or refused to answer. Both the mean and median book-reading figures have fluctuated over the years, and there is no indication that the intensity of book reading over the years has permanently shifted in one direction or another, according to the Pew Research surveys and similar polls by Gallup. In the most recent survey, those most likely to be book readers included women; young adults (those ages 18-29); those with higher levels of education and higher household income; and whites. These patterns largely hold for overall book reading and for the different reading platforms – printed books and e-books. The average woman read 14 books in the past 12 months, compared with the nine books read by the average man, a statistically significant difference. The median number of books read by women was five, compared with a median of three for men, which was not statistically significant. Those with higher levels of education were more likely to have read multiple books than those with high school diplomas or less. The typical college graduate or someone with an advanced degree read an average of 17 books in the previous year, compared with nine for high school grads and three for those who did not graduate from high school.